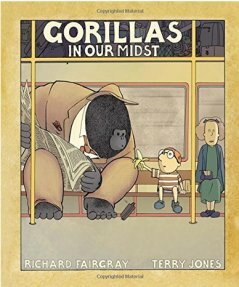 Last year Richard Fairgray and Terry Jones published an illustrated children’s book titled, “Gorillas In Our Midst.” It’s a tale that's sure to become a classic with all age groups, but especially with our little ones. In stark reality, current events have provided us with a snapshot at how meaningful these magnificent animals are to us, and how our engagements with gorillas don’t always end happy, especially when a child is involved. Two viral zoo events this past week involved children interacting with gorillas resulted in two very different outcomes. The first was a heart-warming photo taken at the Fort Worth Zoo in Texas. It captured a two-year old girl named Braylee joining hands through a glass display with Gus, a baby gorilla. 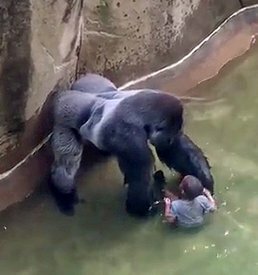 The second sent horror waves that reverberated around the world, when Harambe, a 450-pound gorilla was shot dead, after dragging a four-year-old boy across a moat within his captive enclosure at the Cincinnati Zoo. Braylee & GusBack in March, in a blog I wrote titled, “Gorillas, Endangered Gentle Giants With A Heart Of Gold,” I researched our closest evolutionary cousins. From photos capturing one gorilla cuddling a lost duckling at the Bristol Zoo in England to the seminal work ‘Gorillas In the Mist” by naturalist Dian Fossey to the late comedian Robin Williams meeting with Koko the signing gorilla, it was insightful to learn that creatures this formidable in size could be so compassionate in nature. Jane Goodall suspends judgment. . .
Harambe & 4-yr oldOne week after the Cincinnati Zoo incident, animal advocates and parents are still trying to process whether or not Harambe appeared as a significant threat to warrant his execution? Considered to be one of the world's foremost experts on chimpanzees, Doctor Jane Morris Goodall is best known for her 55-year study of social and family interactions of wild chimpanzees in Gombe Stream National Park, Tanzania. Regarding the Harmabe incident, Goodall has suspended making a judgment, for now. While she's made no official statement of her position as to what transpired, Goodall did write a letter to Thane Maynard, the director of the Cincinnati Zoo. "Dear Thane," Goodall wrote,"I feel so sorry for you, having to try to defend something which you may well disapprove of. I tried to see exactly what was happening — it looked as though the gorilla was putting an arm around the child — like the female who rescued and returned the child from the Chicago exhibit." In what could be interpreted as showing a bit of doubt about the decision to shoot Harambe, Goodall's reference to the child in Chicago is referring to what transpired at Chicago’s Brookfield Zoo in 1996. That event involved a 3-year-old boy who fell into Binti Jua's enclosure where she protected him, while carrying her own baby on her back — again demonstrating the gentle nature of gorillas. Opinions will continue to vary on the rights and wrongs of this case. Unfortunately, playing the blame game will not bring Harambe back to us. 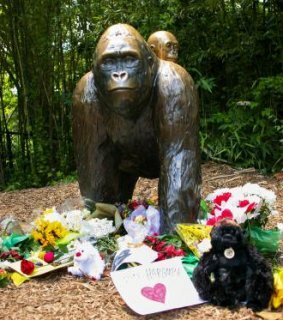 Perhaps the best to come out of this tragedy is for us not to allow Harambe’s death to be forgotten — that the future of human-animal relationships needs our ongoing vigilance. Cincinnati Zoo StatueThe life and/or death of a gorilla or any living organism on this planet should never be taken lightly. They have a purpose and a right to share space on Earth as any human. If Haramabe’s death is to have meaning, in my humble opinion, this should be the time to explore alternative methods of handling this type of case, in advance of it occurring again. Brainstorming workable solutions now are imperative. Whether it be to develop quicker-action tranquilizer guns or some other kind of neutralizing mechanism, we need to devise and develop amenable alternatives, so all future Harambe’s are able to live long and happy lives. Mischief the Talking Raven -- The Animal Video of the Day!! !